We have one good news for the Samsung Galaxy S2 GT I9100 users; you can now install the latest stock XWLPX firmware which is the ICS Firmware in your device. It has come up with many goodies such as; add on stabilities in the Camera, increased battery life etc. and also one of the best part of this firmware is that it comes with the best modems which doesn’t come with issues like device getting heated up etc. So, is doesn’t be a good reason for you to update this firmware immediately in your Galaxy S2 GT I9100 device. This update ropes in the latest ICS Android 4.0.4 firmware version. As of now; this firmware version is available only in the selected countries and also applying this update doesn’t root the device in any manner which means that warranty is intact even though this firmware is applied. DISCLAIMER : Before, start to update this firmware in your device please follow the given below instructions properly or else it may brick your device. So, we would not be held responsible or liable for that. Before start to apply this update we strongly recommend you to take backup of all the data (i.e SMS, MMS, Call logs, APNs etc) present in your phone. Just in case; if your data might corrupted or erased due to any reasons you can easily recover them with the help of backup. But don’t use KIES to backup the data since it doesn’t detect your device. So, once you confirmed you have done all the above mentioned instructions, then you can switch over to the next steps which we have given below on how to apply this firmware update in Galaxy S2 GT I9100. 1. First download the XWLPX Firmware Package and Odin from here to your computer. Once downloaded, extract both the zip files preferably to the desktop. 2. Now, turn off the device so that it can be then entered in the download mode. It can be entered by pressing the Volume Down Key, Center Button, and holding both simultaneously press the Power Button after which a green robot will be shown indicating the Download Mode has been entered. 3. Open Odin in your computer. Connect your device to the computer with the help of original USB cable and then you will see that the ID : COM Section will turn Yellow. NOTE : If ID:COM section doesn’t turn Yellow, then install the USB Drivers in your computer and go to the path “Settings > Wireless & Network > USB Settings” and ensure that “Samsung KIES” option is ticked before connecting the phone to the computer. 4. Click on “PDA” and select the tar file which you got after extracting the firmware update package. After selecting the PDA file, click on “Start” to start the process of firmware update. 5. As soon as the device is updated successfully, the device will be restarted. As soon as you see the home screen or language preference setting options, you can then disconnect the device and turn Off the device in the recovery mode. 6. 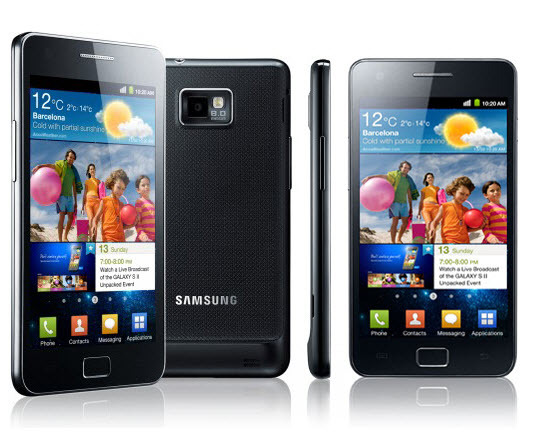 Recovery mode in Samsung Galaxy S II I9100 can be entered by holding the Volume Up button + the Home key button (the middle button). While holding these both buttons, turn ON your device. 7. In recovery mode, select “Wipe data/factory reset” & “Wipe Cache partition” for clearing out all the cache data present in your device. Once it’s done, select “reboot system now”. 8. If you want to check whether the firmware update has been applied or not in your device just go to the path “Settings > About phone > firmware version where it will be mentioned as XWLPX. NOTE : In rare cases, the device would not be updated and gets into the boot loop mode, if you too face the same problem then; clear the cache first from the recovery mode and retry the whole process from the start. Don’t forget to share your thoughts in the comments section. If you have any issues to update this firmware in your android device then let us know, we will try to rectify the same as soon as possible. You put the NOTE: part about the “turning yellow” AFTER you said to go into download mode! Now I can’t exit download mode! !